Today the passage from Matthew tells about a magnificent banquet held by a king, to which the rich and famous would have been invited. The story tells that suddenly the guests who had all promised to be there, suddenly turned down the invitation, made excuses and became enemies of the king. It sounds ridiculous, why would everybody treat the king in such a fashion when they had been invited as special guests to his feast ? The story might seem to lack credulity, it appears far fetched, people just don't behave like that. Even if the guests wanted to abuse the king surely they would wait until after they had enjoyed the party! Jesus has a serious point to make. 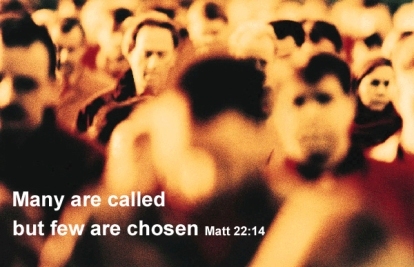 God has called people to his banquet, special guests - but people do not accept the invitation. No doubt Jesus has certain people in mind when he spoke, people who had been violent towards him in his ministry, even though he was sent by God. Today the story has a further meaning. Now the invitation is made to you and I, each one of us is invited to share in the celebration of God's kingdom. You have your invitation, are you going or not? When the people of Israel saw that Moses delayed to come down from the mountain, the people gathered around Aaron, and said to him, ‘Come, make gods for us, who shall go before us; as for this Moses, the man who brought us up out of the land of Egypt, we do not know what has become of him.’ Aaron said to them, ‘Take off the gold rings that are on the ears of your wives, your sons, and your daughters, and bring them to me.’ So all the people took off the gold rings from their ears, and brought them to Aaron. He took the gold from them, formed it in a mould, and cast an image of a calf; and they said, ‘These are your gods, O Israel, who brought you up out of the land of Egypt!’ When Aaron saw this, he built an altar before it; and Aaron made proclamation and said, ‘Tomorrow shall be a festival to the Lord.’ They rose early the next day, and offered burnt-offerings and brought sacrifices of well-being; and the people sat down to eat and drink, and rose up to revel. Lord, you are my God; I will exalt you, I will praise your name;for you have done wonderful things,plans formed of old, faithful and sure. For you have made the city a heap, the fortified city a ruin;the palace of aliens is a city no more,it will never be rebuilt.Therefore strong peoples will glorify you;cities of ruthless nations will fear you. For you have been a refuge to the poor,a refuge to the needy in their distress,a shelter from the rainstorm and a shade from the heat.When the blast of the ruthless was like a winter rainstorm, the noise of aliens like heat in a dry place, you subdued the heat with the shade of clouds;the song of the ruthless was stilled. Once more Jesus spoke to the chief priests and Pharisees in parables, saying: ‘The kingdom of heaven may be compared to a king who gave a wedding banquet for his son. He sent his slaves to call those who had been invited to the wedding banquet, but they would not come. Again he sent other slaves, saying, “Tell those who have been invited: Look, I have prepared my dinner, my oxen and my fat calves have been slaughtered, and everything is ready; come to the wedding banquet.” But they made light of it and went away, one to his farm, another to his business, while the rest seized his slaves, maltreated them, and killed them. The king was enraged. He sent his troops, destroyed those murderers, and burned their city. Then he said to his slaves, “The wedding is ready, but those invited were not worthy. Go therefore into the main streets, and invite everyone you find to the wedding banquet.” Those slaves went out into the streets and gathered all whom they found, both good and bad; so the wedding hall was filled with guests. This weekend I have a wedding invitation to the school chapel at Bedford School, followed by a dinner reception. It all starts about 2.00pm and will no doubt finish late, far too late considering I have an 8.30am communion! It has been in my diary for months and months, probably since early last year and I completed my RSVP a long time ago so that Henry and Eve would know that I was going. It would have needed to be something really serious to prevent me from going because it is going to be a happy celebration and I am planning on having a good time. Am I going - Of course ! In the passage from Matthew this week we see Jesus telling a parable about another special invitation to a celebration banquet. This isn’t just an ordinary invitation to which a man invites guests, it is an invitation from a king. I remember last year receiving an invitation to a garden party at Buckingham Palace from Her Majesty. Now I know that if Queen Elizabeth received a reply from me saying I wasn’t going to make it she would not send the palace guard round to chop off my head. She might be upset at me not being there. My reason for going was because this was a big deal, of course if the Queen sends you an invite then you know this is going to be a really important gathering. It’s not every day you get to wander around the grounds of Buckingham Palace and walk through all those corridors you see on television. 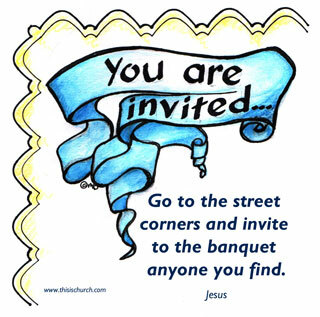 .In the passage from Matthew this week we read about a very special invitation to a banquet. It is not just an ordinary party to which a man invites guests, it is an invitation from a king. When kings threw banquets and invited you along you went, not because you necessarily wanted to, but because it was expected. It’s just like the boss inviting you round for a meal, if you want to get on you go, you don’t say you have a better offer or make excuses. So, the best food and drink would have been prepared, servants were sent out to "summon the invited guests to the feast." According to the custom of the time, the guests would already received the invitation and were waiting for when things were prepared and they received the announcement to come to the feast. The guests had already accepted the invitation and been catered for! Yet in the story from Jesus those who the king invited turned down the invitation. They never turned it down because there was something that really prevented them from going, they just made lame excuses. Frankly it is all rather strange and it becomes even more confusing when we read that the reaction of some is not just poor excuses but they kill the servants who bring the invitation. This is a parable which doesn’t leave a lot to the imagination and those who heard it would have a pretty good idea what Jesus was getting at. The King is God and the people who were invited were the Jews. God was planning the great party which the Jewish people had known about and waited for a long time, but now at the last minute they were refusing. The servants who were killed were the prophets who had proclaimed the coming kingdom had been ridiculed and killed. The hearers would also come to realise exactly what Jesus meant when he spoke of the King sending his soldiers to destroy the city. After the fall of Jerusalem in AD70 the pieces of the story would all fit neatly into place. So what about those who came? Since the guests who were invited refused, the invitation went out instead to all and sundry. People who would never have imagined being invited to such an event heard the call, the labourers, the down and outs, the criminals and just ordinary folk. Nobody who came would be able to boast of anything they had done to get there. They could claim no privilege or rank. None of them had a special status. They came because they were hungry, not because they could afford it or were posh. So the parable becomes our story too. We are now the recipients of God's gracious hospitality and generosity. We are Christian people because of God’s generosity, not because of any good we may have done. We claim no right and we feel privileged to find ourselves in the banquet hall. We are from the highways and byways no longer. We are honoured guests. Just like the guests invited to the banquet in the story, each one of us is invited as a special guest by God to his celebration. It is a truly remarkable thing that God should bother with us at all and yet he goes so far as to make us honoured guests. In the midst of a troubled and turbulent world, where the frailty of life is ever before us, the simple message of this parable should come to us as a great reassurance. In spite of the seeming unimportance which attaches to us in the universe, nevertheless our lives are significant. Life might so often seem cheap and unimportant and yet we are individually watched over and cared for by God. The realisation that God is involved with each of us should change the way that we think about things, life is no longer a series of abstract choices, we are not adrift subject the vagaries of life. This message should cause us to have much peace and a sense of purpose for the future which gives real meaning to our lives. An invitation to a wedding or a special party is often seen as a good reason to go shopping. Ladies will sometimes spend hours discussing their outfits beforehand but gentlemen also usually make an effort even if the clothing is an easier choice. In the parable Jesus tells of somebody thrown out of the party because they don’t have the right clothes, what was he getting at? we can’t be sure but it is worth remembering that clothing is a common New Testament metaphor for spiritual change. For the Christian, the clothing about which we are concerned is not visible garments but rather character and behaviour. Our lives should not just demonstrate the same old predictable behaviour, rather we should exhibit something of the holiness and goodness of God. We take off those clothes which are unsuitable and change into something appropriate. For those who are called by Christ it is unthinkable that we should not now be spending time getting dressed in the right clothes. Love divine, all love’s excelling. Prayer is a plant, the seed of which is sown in the heart of every Christian, if it is well cultivated and nourished it will produce fruit, but if it is neglected, it will wither and die. Lord Jesus, it’s a shameful thing when you’ve set invitations to all who will come and we stand at the door and turn people away. It is shameful how we find ways to justify, in Your Name, the lines we draw between us, the exclusions and suspicions, the greeds and power-plays, that harm the least, and protect our special interests. And so we pray: Lift us above our pettiness and self-protection, and use us as Your agents of justice and mercy; May Your grace open our doors, stretch out our arms and turn our attention to the excluded, rejected and neglected ones. May Your wisdom teach our minds, open our hearts and challenge our apathy to find solutions to the conflicts and self-created threats in our world. May Your love release our energies, ignite our abilities and inspire our action to heal those who carry the scars of abuse, war and disease, to comfort those who grieve the loss of loved ones or opportunities, to restore the ones who have failed or fallen, to nurture the life that breaks out in every person and every part of our planet. And make us heralds of Your kingdom who extend Your invitation to all who will listen. Amen. The people living in darkness have seen a great light: on those living in the in the land of the shadow of death, a light has dawned. The reading in Isaiah is one of praise to God, who has done marvellous things. It is about victory and it looks forward to God’s ultimate victory, when the reign of God over his re-created world is to be ushered in with a feast, a coronation festival. It is for all men, for the covenant of his mercy is all-inclusive. The feast described will mark his triumph at the end of history, and he will bring to an end the reality of sorrow and suffering which have marked the reproach of his people. We see too the idea that God’s ultimate triumph over his enemies will be also a victory over death and pain. So all peoples will say “This is the Lord, we trusted in him; let us rejoice and be glad in his salvation”. And when in REV. 21:4 the words of this passage were quoted, it was in the light of a new certainty which was theirs who knew that Christ was risen. “Of course, when Jesus told the parable it had a particular point and focus. (It’s possible that verse 7, the bit in brackets, was added later, perhaps by Matthew himself, so that his readers would make the connection between what Jesus was saying and the terrible events of AD 70. We shall see more about this when we get to chapter 24) The parable follows straight on from the devastating story of the wicked tenant farmers in chapter 21, and rams the point home. Everyone would know what a story about a landowner with a vineyard was referring to; equally everyone in Jesus’ day would know the point of a story about a king throwing a wedding party for his son. (Jesus may well have told this kind of story several times; there’s quite a different version of it in Luke 14.15-24.) This story is about the coming of God’s kingdom, and in particular the arrival of the Messiah. Israel’s leader in Jesus’ day, and the many people who followed them, were like guests invited to a wedding—God’s wedding party, the party he was throwing for his son. But they had refused, for the most part; think back to Jesus’ sad warnings in 11.20-24. Now Jerusalem was refusing the invitation as well. God was planning the great party for which they had waited so long. The Messiah was here, and they didn’t want to know. They abused and killed the prophets who had tried to tell them about it, and the result was that their city would be destroyed. Ramadan - Understanding other faiths The Islamic holy month of Ramadan began on the sighting of the new moon, 4 Oct 2005. During the 29/30 days of Ramadan all adult Muslims must give up food, drink, smoking and sexual activity during the hours of daylight. Sawm (fasting) is the fourth pillar of Islam. "Ramadan isn't about how much you eat or drink, it's an examination of the faith inside of your soul. God said that 'your reward depends upon your effort,' and that 'all the other months of the year are for the people, but this one month is for me.' Ramadan is the best month to clean your heart and soul. When you feel hungry you can remember the suffering of the poor, who are usually hungry, and by remembering you can help them always. Ramadan isn't just to forbid you from eating and drinking; it's to forbid you doing any bad thing. During Ramadan, Islamic activities increase, like praying, reading from the Quran, and helping others. These activities strengthen Islamic relationships because you must join with other Muslims." and doth thy cup with love o’erflow? and let them all thy sweetness know. Are they forbid the children’s bread? Lift up your heart, etc. Almighty God, source of every blessing, your generous goodness comes to us anew every day. By the work of your Spirit lead us to acknowledge your goodness, give thanks for your benefits, and serve you in willing obedience. Indeed we pray you to pour out your Holy Spirit upon us - your Spirit of joy and laughter - of comfort and of strength - that we might celebrate with you and you with us, as we offer our worship and ourselves to you this day; through Christ our Lord. Amen.